Do you ever reach the end of your day and wonder if you taught your kids anything valuable all day long? 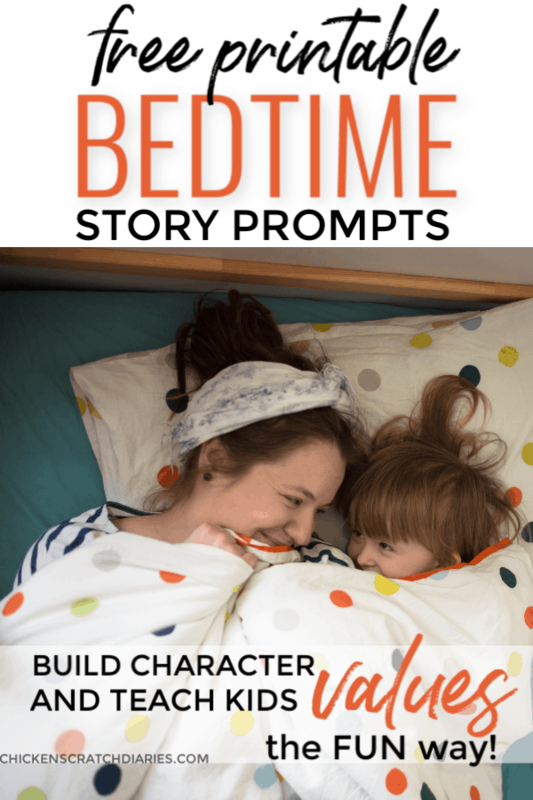 What if you had a list of bedtime story starters that helped you to reinforce those values with little effort? Because believe me- I understand how easy to get caught up in the everyday hustle and bustle that sometimes those “teaching moments” get lost in the shuffle. Yet, I have specific values I want to instill in my kids because I know that internalizing these values is the key to building good character and good decision-making skills. These are goals we probably all have as parents, right? Of course, there are times that there are teaching moments that fit naturally within the day. On our way home from school each day (we have a 15-minute drive), I encourage my older kids to debrief their day by asking lots of questions. They almost always have some story, good or bad, that we can draw a lesson from. We point out examples of good character in these situations, and situations where they can improve – and potentially see a different outcome the next time. If my 9-year-old had a difficult day – excluded by friends and had to endure a terrible school lunch, for example, there are lots of things we can draw from those stories. We might talk about the importance of knowing her value outside of others’ opinions, of asking forgiveness if she’s wronged someone, and of being efficient in the mornings so she’ll have time to pack a school lunch. 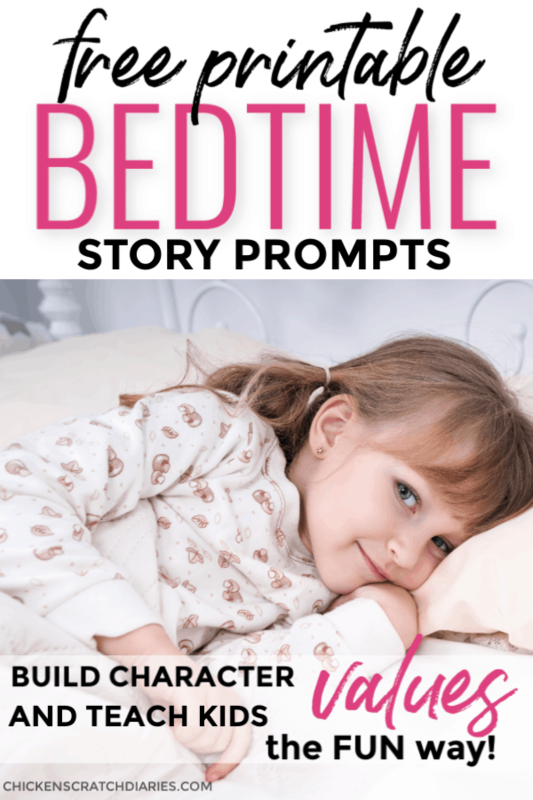 ——–> Don’t forget to Subscribe and download your Free Storytime Prompts printable pack at the bottom of the page! Of course, sometimes listening to our kids’ stories is just about modeling empathy. That’s an important lesson in itself. But asking questions in lots of different ways is a great way to help kids learn to solve their own problems and draw their own conclusions. As my kids get older, I’m learning to be the “solver” less and less – and instead allowing them to think through solutions and consequences (good and bad) on their own. The last thing I want to do is teach values through nagging and lecturing. It’s hard to resist that temptation, but I know it’s largely ineffective. Great conversations can also start around the dinner table. Honestly, any time you have your kid’s fairly-undivided attention free from electronics is a good time to talk! Lately I’ve noticed that with my younger kids, even though I’m home with them most days, our time together involves one activity after another- lots of cooking or meal-prepping, clean-up, diaper-changing, laundry … the list goes on. And I also work at home … so it’s easy for me to get distracted and forget about those teaching moments. There are nights that I tuck my four-year-old in bed at night and think, we didn’t even read any books today! Wait – how many hours did he spend playing Minecraft? I lost count. Here’s another confession: we’re not very good at getting the kids to bed on time every single night. So when it’s getting late, I’ve been known to skip bedtime stories because of the added time it takes. And I hate that. We have lots of great books … way too many in fact. So the problem is, when it’s already late, I don’t want to spend 10 minutes allowing him to pick the “perfect” book so he can delay bedtime even longer. Not long ago, I remembered something I used to do with my older daughters starting when they were preschool-aged, or old enough to enjoy stories. When I tucked them in at night, I would make up a story. Sometimes it’s tough thinking of kids story ideas on the spot, so it started out with retellling classic fairytales. I would tell my own version of Hansel and Gretel, Little Red Riding Hood (usually a less traumatic rendering!) and every other fairy tale I could think of. The stories became more complex over time and we added characters and plot twists. There were specific voices for many of the characters, so I guess it was our own version of a dramatic reading. When my girls were old enough to share a room and hear stories together, they would give suggestions of stories they’d like to hear. They became super silly over time. Their all-time favorite was “Ashlyn Ella Tinkerbella’s Adventures with Leftovers.” As the story went, she was a lonely princess who didn’t have any friends, so one night she crept down to the kitchen and went through the fridge … and made herself a friend out of leftovers. She sprinkled some fairy dust on the pile of leftovers and, voila, instant friend! Looking back, it sounds pretty unsanitary. 🙂 But my girls LIVED for these stories at bedtime. They still talk about it years later. So one night recently as I was tucking my son into bed, I asked him if he’d like to hear a story. I knew princesses and fairies wouldn’t be his cup of tea. I gave him some options, and we started with Jack and the Beanstalk. Over the last few months, I realized that although the bonding experience is just as important – I can enhance storytime by weaving some important values into these tales. You’re probably thinking, why not just read some of those awesome books on the shelf that teach values? Well, we do that too. But I’ll be real here: at bedtime, reading a book and fighting over the turning of the pages and wanting to examine each.and.every.picture ….it’s a little much for this weary mom when we’re already behind schedule. Telling stories out loud goes more quickly for us, and it achieves the same purpose. It’s also unique because you get to make more eye contact and see their inquisitive little expressions! And our boy, like our girls a few years ago, loves these stories and begs for them as soon as bedtime rolls around. Recently our stories have been about little boys and girls just about his age (clever, eh?). They learn empathy for the lonely elderly neighbor down the street; how to be helpful to their family members; they go on adventures to places we’ve always wanted to visit; they eat my son’s favorite foods and wear his favorite colors and make new friends everywhere they go. What’s really interesting is that these are short, made-up-on-the-spot stories. You wouldn’t think they would have a major impact on your kids, but I’m amazed that my preschooler remembers all the little details – and the lesson that accompanies it. Lately, he’s asked for a “new” story every night, and I’ve had to get pretty creative! So I came up with a list of “Storytime Prompts” that I can refer to when I need some fresh ideas. It’s a fun activity to teach values and something we both enjoy greatly. 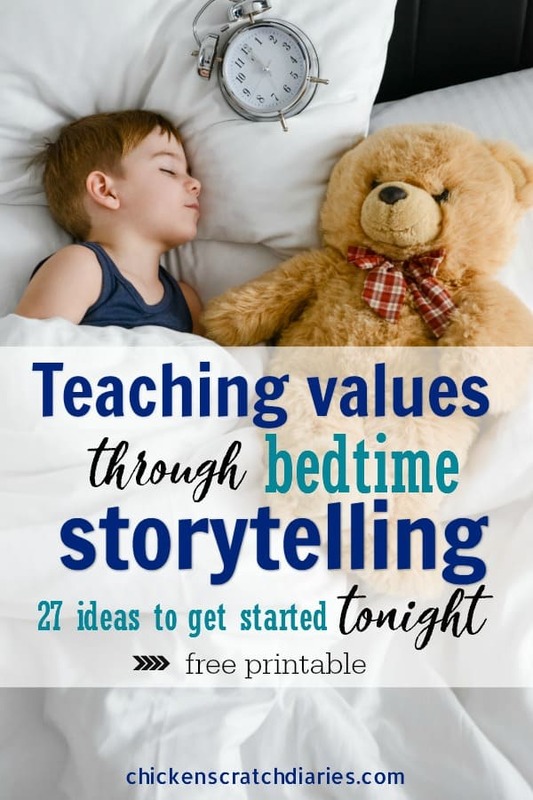 I’ve brainstormed 9 groups of values with a total of 27 corresponding bedtime story ideas. Then all I have to do is incorporate a few personal details (that’s where the favorite colors, etc come in), to make the story relatable and fun. I would recommend these stories for kids up to age 6 or 7. If you think your child would LOVE storytime (with a purpose) like my kids do, subscribe to our newsletter below and I’ll automatically send the Free Storytime Prompts Printable to your inbox. You’ll also receive access to our Freebie Library with more printables on parenting and household management (which is always growing)! *Please check your inbox to confirm your email once subscribed. I hope your family enjoys this activity for teaching values to kids – the fun way! I’d love to hear how you use these value based stories as a creative teaching tool for building character, and as a special time to bond with your children. « 20 Quick Dinner Ideas: Homemade + No Recipe Required! Storytelling is a favorite in our house too! But like you mention, it can be a challenge when you have a 3-year-old who wants a “new” story every evening and has a super sharp memory. I’m going to have to check out your prompts! We also tell stories on our walks/hikes and just get absorbed into an imaginary world for the morning. Awesome post! It’s a great way to connect and unplug, isn’t it? I’m thankful for my little ones who still relish the simple things like made-up stories! It cracks me up how, even now, I’ll start to tell a story and describe a little boy that’s just like my son and he’ll gasp and say, “I like Transformers too! Wow!” (or whatever the details are). LOL. Thanks for stopping by Bridget!